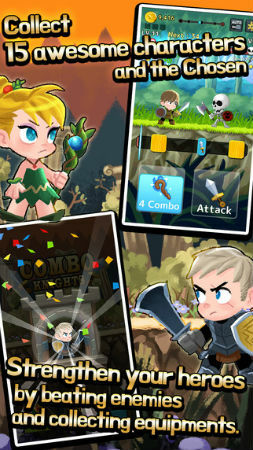 Combo Heroes is an action RPG that aims to set itself a little away from the usual crowd on iOS. it does things slightly differently from many touch screen RPG games in several ways. The first is that you don’t need an Internet connection to play, which will be a relief to many gamers who often play when they don’t have access to a mobile connection or don’t want to use up their data. Secondly, you can play in portrait mode, meaning you only need one hand to play, and thirdly, the game is only 37 Mb large, with no extra downloads, meaning that you can get to playing the game much faster. All of these things would be a waste of time however, if the actual gameplay didn’t stack up but thankfully that is not the case. The gameplay has a bit more depth to it than a previous RPG we reviewed, Undead Clicker, as you can actually affect the defence of your party with taps on the screen, in addition to being able to attack. There are plenty of items to find for your characters, and I liked the way they are automatically applied to your team as this makes everything far more streamlined as you know you are always at the most optimal level for battle. – Tap! Tap! Tap at the right time to attack and defend. – Accumulate combos to perform powerful skills on enemies. – You can play anywhere with no network. On a plane, abroad, below the sea, and even in space! – You can enjoy the game with only one hand in portrait mode. – Only 37Mb size with no additional downloads! Don’t wanna wait another 5 minutes after starting the game, right? 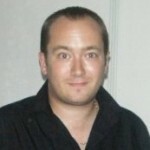 – Decide what stats to upgrade! Choose wisely and make your own powerful heroes! – Convenient upgrade system! Each item obtained during the game is applied to every heroes automatically. No need to choose. – Face the ultimate boss by collecting 5 artifacts. Defeat the boss and finish the game. However, danger awaits beyond the abyss! The graphics are very well done, with plenty of colour and tone to all the characters and backgrounds. The game has a genuine cartoon look to it, with the graphics artist clearly very talented. Hacking down enemies is good fun, with the Golf game style attack meter working really well in the context of this title. Overall, this is a pretty deep action RPG that automates the right things and leaves the rest to the player. With some of the best graphics we have seen in a while, Combo Heroes comes highly recommended.